We first met Simon some time ago, when our “Healthy Life” project was in its infancy. We had decided to go to Norsey Woods for one of our regular walks and there he was, sitting on a tree trunk whittling, in what appeared to be a disused wood yard. There was a table displaying various goods that he had made, and we wandered in to have a look and a chat. It transpired that Simon had worked in the stock market, but now worked in this lovely environment. Quite strange that his change of lifestyle seemed to epitomise the very essence of our magazine. This is his story. We hope you enjoy it and, more importantly, hope it will inspire you to look at your own lifestyle and perhaps have the courage to take the first steps to improve your quality of life! I left school shortly before my sixteenth birthday with very few qualifications under my belt. But both my elder brothers worked in the city and my father worked for a large stock broking firm, so it was the obvious choice to follow in their footsteps. I had what was considered a “job for life” with terrific prospects. The money and perks were great. For really quite a young lad I was doing pretty well. Nice clothes, a fast car when I was old enough, plenty of money to take the girls out……………….!! I really was the envy of my friends. But after a while the money and the glam life seemed to pale. It was not really me. I loved the outdoor life – I had been involved with the scouting movement for years and enjoyed every minute of it. The idea of becoming a forest ranger within Epping Forest appealed, but everyone thought I was mad and talked me out of it. Then I met my first wife, and my main priority was to provide a good lifestyle for us both. A nice home, quality furnishings, lots of holidays. Unfortunately money does not always buy happiness, and the marriage failed. I was disconsolate, and to compensate continued to put all my energies into climbing the career ladder. I was very successful by the time I met my second wife. We married and, once again, had a very high standard of living. But the pressure of city life was beginning to take its toll, and I was eventually signed off work with stress. Gradually I recovered to the extent that I felt I ought to return to work, although I hated the idea. My wife was still working, so we put the appropriate child care arrangements in place. It seemed, however, that I was destined not to return to the city because the arrangements we had so carefully made did not work out. It was then that I decided I would take on the permanent role of “house husband” My wife was incredibly supportive of my decision not to return to full-time employment, and when I saw some adult education courses on woodland management and crafts at Belhus County Park in Aveley, she actively encouraged me to enrol. I learnt so much about balancing the wants of the general public with the needs of wild life; about how to maintain natural habitats, and how to produce a yearly timber crop. The children were at school by now, so I did have some free time. When I completed the course I volunteered to work with the rangers at the park and continued to learn more about the woodlands and meet others with the same interests. I met people who were so talented in woodland crafts. My wife, still as supportive as ever, bought me a lathe for my birthday so I could “try my hand” at wood turning. Try as I might, all my efforts to produce something that I could be proud of seemed to elude me! But eventually I discovered that with a knife and a good piece of wood, I could carve away and form some really nice Love Spoons – they are now my pièce de résistance! I then extended my talents to whistles, toys and benches! When I saw the yard at Norsey Woods I was sure it must have been fate. 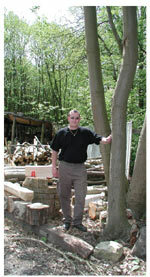 I can now participate in the coppicing and use the wood for my crafts. My repertoire has extended to larger items such as rose arches, garden benches and tables, besom brooms and hay rakes. I have now managed to install a charcoal kiln to ensure as much of the coppiced wood as possible is utilised, and this makes a very high quality barbecue charcoal. I also have a couple of small charcoal kilns which I am able to take to events so I can demonstrate the making of charcoal, as well as showing my other natural wood products. I just feel so lucky and privileged. I can enjoy my passion for the “great outdoors”, and at the same time make something usable and traditional with the wood. OK – I don’t earn so much – but I love life.